Parenting is one of life’s greatest joys, but is also hard work. As a pediatrician, my role is to be your partner and advocate when it comes to your child’s health and well-being. I strive to approach every relationship in a calm, warm, collaborative manner, supporting you as parents. My greatest satisfaction is getting to know and care for your children, from newborns to young adults, with all the growth in between!" The son of an Air Force pilot and elementary school teacher, Dr. Lincoln had the opportunity to live internationally and across the country during his childhood. He continued sampling life in various locales throughout his education, majoring in biology at Brown, and then attending medical school at Tulane University, where he also received his Master of Public Health. In medical school he met his wife, who is now an OB/GYN, and together they fell in love with the Pacific Northwest and moved to Portland to finish their medical training. Dr. Lincoln completed residencies in Pediatrics as well as Preventive Medicine at OHSU. Following completion of his residencies, he worked as a solo pediatrician at an underserved community health center in northeastern Pennsylvania via the National Health Service Corps, and joins Metropolitan Pediatrics after serving as the medical director of OHSU’s General Pediatrics clinic. Devoted to providing comprehensive care to every child in a caring and family-centered way, Dr. Lincoln looks forward to working in collaboration with caregivers to help children thrive. Special areas of interest in his practice include helping families meet their breastfeeding goals, including evaluation and treatment of tongue tie; incorporating positive parenting strategies; participating in advocacy and public policy around child health issues; and teaching medical students. 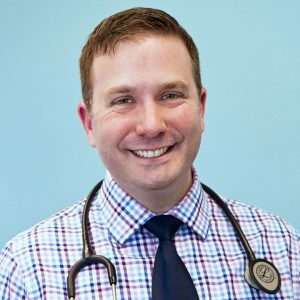 In his free time, Dr. Lincoln enjoys DIY projects around the house, reading, hiking, and exploring the Pacific Northwest with his wife and two young sons. "Dr. Lincoln is such a great doctor. We have been going here for over a year. He is kind, gentle, and not in a hurry to leave the patient's room. He always answers all our questions and is very knowledgeable. He is not judgemental of any parenting style and says his professional opinion. The clinic itself is wonderful. All staff are professional and kind. Clinic is always clean. Seems they are never understaffed. 5 stars for me!" "Finally, a professional clean caring doctor right next to our home on Mount Scott. You Rock! Metropolitan Pediatrics in Happy Valley ! From the minute my son and I walked through those doors we felt like we had found that small town doctors office that we were looking for. We are from Santa Barbara County and lived 6 years in Sisters Oregon, a very warm small community and we were looking for You! In this big city area it’s difficult to find a place that will slow down and talk to you like you are family. The 24 year old or so secretary that was seated up front was so warm and friendly from the moment we came in, as well as another woman who was multitasking with a headpiece, very impressive. I couldn’t help but to drop all my worries and just let the visit ride . We saw Dr. Lincoln quickly and he really helped my shy 13 year old son feel like he wanted to ask questions about his body, losing the look of worry. He has survived bullying and I watch closely how people treat him of course and Dr. Lincoln was a good doctor . You now have a new patient! Thank you Metropolitan Pediatrics"
"Had a great check up with Dr Lincoln. I always leave feeling reassured that I am doing all that I can do ensure my sons health and well being. Dr Lincoln is a big part of making me feel confident and proud as a new mom! Thanks to the team of nurses who are understanding and compassionate about what they do!" "Great pediatric care! I love that the office is close to my home. Dr. Lincoln is my son’s pediatrician and he is awesome! Him and his staff are always there to address any issues/concerns We may have. I’m usually able to get quick answers through the messaging portal. I love that there is weekend care as I have had to take my son in on a Sunday. The nurse advice line is also helpful. Whenever I’m in the office we never have to wait long." "This place is fantastic. Dr. Lincoln is my doctor and I was just telling my mom that I couldn't envision anyone being able to do a better job. That man has found his calling. The receptionists and nurses I have worked with have all been great as well. I feel blessed to have found such a great place for my son." "Everyone here is always so friendly and happy. Our pediatrician is Dr. Lincoln and I could not be more happy with someone like him. He's great with kids very experienced and has great connections with a lot of the other hospitals and doctors in the area when needing referrals for other practices." "The front desk gals are always really friendly and we LOVE Dr. Lincoln! He is so personable and it's clear each visit he makes an effort to remember all of his patients and little personal details about us." "I strongly recommend this pediatric clinic! They treat everyone with respect and the doctors are phenomenal. I used to see Dr Edward Hamel when I was a youngster. My littles see Dr Lincoln and he is great. He interacts with the kids and takes your concerns with your children seriously. I strongly recommend." "I love this place! Doctor Lincoln is fantastic with my 6 month old and my nine year old! He is so kind and informative. He really loves what he does. The front desk staff and medical assistants are amazing as well. So glad we started coming here!!!"